Call it an exercise of trying to do the right thing. For me. I win some fights. I lose some fights. After having a great day at Seoul Land with my family and Da Missus’s friend’s familt, I was beat. I didn’t think I had it in me to create anything, let alone art or a post. But I felt compelled to give it a go. I had nothing to lose in making the effort. The artwork went first. 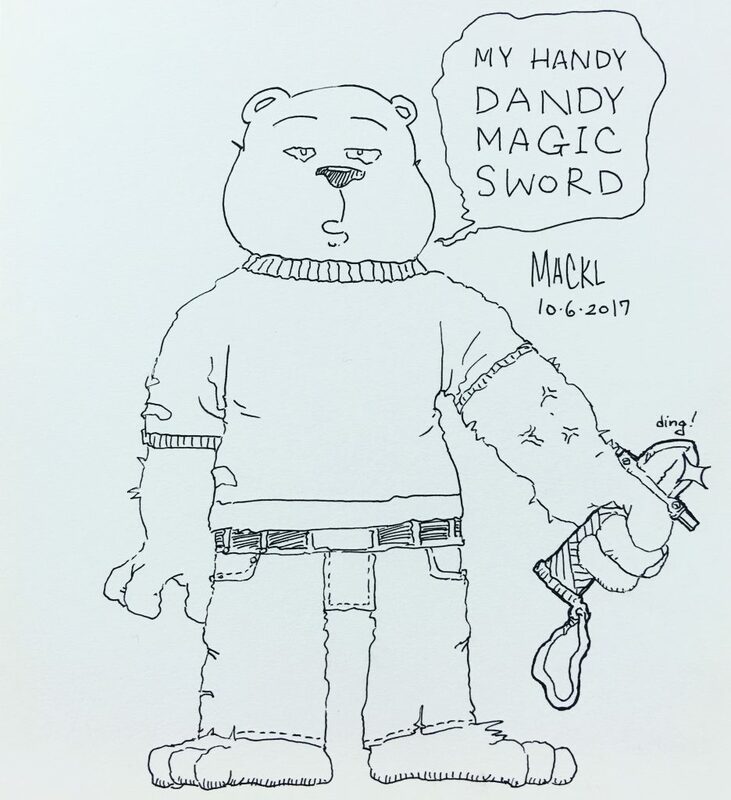 Today’s Inktober theme was ‘sword’. For this piece of art, I took out .38 black gel pen. I started with the eyes. I saw a bear and proceeded to draw a bear’s face. Then the body. Then the sword in its left hand. Normally I would like to do a pencil sketch (like the one I did yesterday) before inking, but I was too tired to prep like that. I mostly avoided think and thin lines for the same reason. If I made any mistakes, I’ll call them ‘happy opportunities’. I was just glad to get it done. It looks alright in my eyes. Then I thought about this post and one other task involving the online business. The post was the second most easiest thing for me to do. So here I am, already over the halfway point of how many words I’m trying to write each day. The fact is that I’m already late. Again. I’m not making any excuses either. I could’ve done this earlier yesterday before heading out the amusement park. The problem was that I was trying to do other important matters. My eyes are a bit blurry and my concentration is waning. I seriously doubt whether I can work on my online business. But one task at a time. I still have ways to go in writing this post. It was ridiculous to wait an hour for a minute and a half ride. But I did that with Da Missus and Da Little One. The other rides took a bit less. The Viking took the least amount of time. I should’ve have ridden it again with Da Little One. Da Boy and Da Missus’s friend’s son went on their own and found the rides they wanted to try. Da Missus first loaned her smartphone so we can contact each other. When they came back the first time, the smartphone battery was at 7%. Da Missus told them to make a collect call to meet up later. Da Kids always want to play with electric gadgets. Even when we were briefly at Homeplus to eat dinner, they ended up at the Samsung Electronics area playing with the Samsung Tabs! Da Missus wasn’t too happy about that. What I want to say is that we do what is important to us. If that important matter is playing the piano or sketching for an hour, we do it, rain or shine. I’m taking control and responsibility of what I want to accomplish. If I don’t, someone else will. Let’s take the time to work on things important to us. Meaningful, purposeful work daily, alright?